There is still time to plant and grow a garden before summer arrives. Bring God’s Word alive for your children by teaching them how to plant, cultivate, and harvest a garden this summer. Some easy plants to grow from seeds are green beans, pumpkins and zucchini. If you feel uncomfortable growing seeds try a tomato, basil or oregano plant. Tomato, basil, and oregano plants are great to plant as all three work well in making tomato sauce for an easy spaghetti dinner to be enjoyed later in the summer. Ask your local garden shop for the best way to grow the plants you decide to purchase for your area. Teaching your child how to tend a garden takes time and patience. What great character qualities to instill. 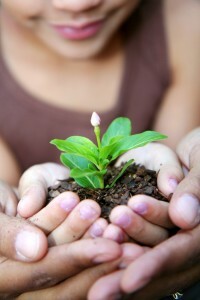 Time and patience are modeled to your child as you plant, tend and care for the seeds and plants together this summer. Whether growing a vegetable or flower garden there are ways to involve even young children. For the young child begin with larger seeds as sunflowers, pumpkins, or squash seeds. These seeds will be easier for a child’s fine motor skills. Tools that are a children size such as a shovel and wheelbarrow make gardening more fun. The child can model their parent using the same grown up tools. After planting, watering is best with a sprinkling can or a nozzle attached to the hose so the seeds and plants do not get washed away. God’s sunshine and rain (or your child’s watering) will in time grow your plants to maturity. I know that you will all enjoy the fruits of your labor. Some wonderful children’s books about gardening and growing plants include: “Roots, Shoots, Buckets, and Boots” by Sharon Lovejoy, “Planting a Rainbow ” by Lois Ehlert, “Gardening with Kids” by Catherine Woram and Martyn Cox, and “Jack’s Garden” by Henry Cole. There are many references to plants and growing in the Bible. A good word study may include looking up the verses of the Bible that contain the word “grow”. Make this summer one of growth for your family both physically and spiritually. When teaching the Bible verse Psalm 104:14 to your child make sure that they understand each word. The word “livestock” means horses, cattle, sheep or any other useful animals kept on a farm or ranch. The word “cultivate” means to improve or promote the growth of a plant by attention and care. By having a better understanding of the words and concepts in the Bible your child will understand God better. With practical application of God’s Word, as actually growing and cultivating a plant, children are able to learn about God and the world He created. A child also learns how amazing it is to watch a plant grow and eventually provide food just as Psalm 104:14 states. Gardening is a “growing experience” in that both child and adult learn from watching and participating in life together. Check out Truths for Tots on Pinterest or Facebook.